The TRE CIME ADVENTURE PARK is situated in the wonderful view of the Three Peaks of Lavaredo which was declared an UNESCO World Heritage site. In the Park there are five air routes, at different heights, for visitors of every age. 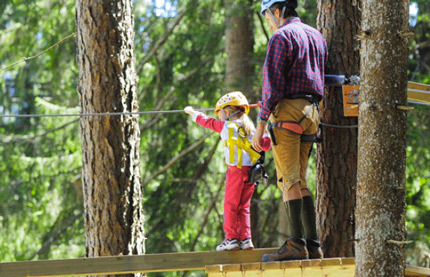 Children (from 3yo until 5yo) can try game routes in complete safety; boys, girls and adults can choose among 5 different routes, until they find the most challenging one, to test themselves in routes which are even 14 metres high. Everybody has the opportunity to reach the 20 metres high panoramic platform, where there is an observation point from which you can admire the Three Peaks of Lavaredo. Preparatory area on land : 3 preparatory lines close to the reception. GREEN route: Preparatory area / easy for children / 8 platforms / activity 1.5/2 metres high. GREEN plus route: children area/ easy /8 platforms / activity 2.5/3 metres high. BLUE route: medium easy / 16 platforms / activity 6/10 metres high. RED route: difficult / sporting/ 9 platforms / activity 12/14 metres high. 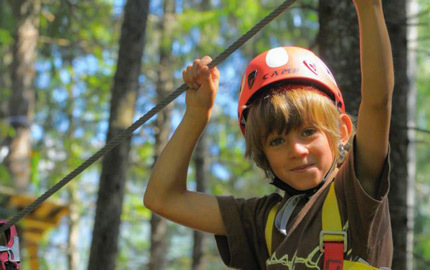 TRE CIME ADVENTURE PARK takes advantage of a skilled staff that welcomes visitors and controls the Park, by assuring each visitor the best adventure possible. Birthday parties, parties, music shows, Tree climbing, Nordic walking. The perfect environment to create Team Building Experiences and Motivational Incentives. We have planned different activities for children at school-age in order to bring them closer to climbing and wood in a safe but exciting way. We propose group activities and games in order to develop mobility coordination and team working and to make the visit of the park educational and positive.